Event Description: One of the world’s leading universities, Stanford stresses research along with teaching. It’s also a great place for a teambuilding treasure hunt event: flat pedestrian walkways, public art, and historical signage abound. Location History: The loving creation of Leland and Jane Stanford, tree-lined Stanford University has been educating and inspiring students for over 115 years. 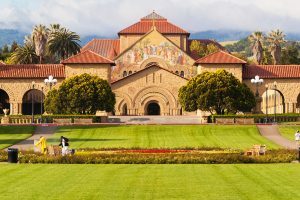 Leland Stanford-California Governor and one of the “Big Four” businessmen who helped build the transcontinental railroad- had a dream: to create a co-educational university of “practical education”, producing “cultured and useful citizens”. During your teambuilding treasure hunt… expect to explore the central campus’ many plazas and arched arcades, dotted with public art and interesting architectural details. Expect to see a stylish water clock; statues from New Guinea; Rodin’s thinker, and plenty more.